Information The 14 Wing Curling Club is located next to the Greenwood Gardens inside the main gate of 14 Wing. 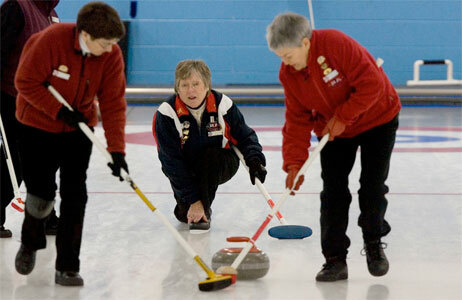 This four sheet Curling Club, with a licensed bar, offers four nights of curling and afternoon and weekend fun. Below is some more information about the different leagues and programs, which run from November – April. Open to anyone between the ages of 11-18 years old with weekly practices on Tuesday afternoons from 4:30 pm to 5:30 pm. Brooms will be provided along with sliders for the youth to learn how to curl but indoor footwear is required. For more information, please contact the Community Recreation Coordinator at 902-765-1494 ext 5337. Open to all Military, DND and Defence Team members, and takes place every Wednesday afternoon from 1 to 3 pm. For more information, please contact Capt. Rob Anderson, at 902-765-1494 ext 3121. For ages 19 and up, and held every Monday evening from 7 to 9 pm. For more information, please contact Stan Olejnik at 902-765-6149. For ages 19 and up, and held every Tuesday evening from 7 to 9 pm. For more information, please contact Sandra Cathcart at 902-765-6516. For ages 19 and up, and held every Wednesday evening with draws at 7 pm. For more information, please contact Darlene Donovan at 902-242-5311. For ages 19 and up, and held every Thursday evening with the first draw taking place at 6:30 pm and the second draw starting at 8:30 pm. For more information, please contact Phillip Gates at 902-765-4319. Fun night is a great way for the entire family to enjoy an evening together socializing and exercising. We try to offer a Fun Night on the last Friday of every month, starting at 7 pm, so keep an eye out for upcoming events! The Curling Club is also available to rent for staff parties, dances or other functions. To inquire about this, please contact Brian Campbell at 902-765-1494 ext 5194. If you have any questions, please give us a call and we’ll look forward to seeing you on the ice!